Im Moment sind alle Plätze für unser Projekt belegt! Allerdings haben wir eine Warteliste für potenzielle Nachrücker*innen. Einfach auf das Bild klicken oder diesem Link hier folgen! 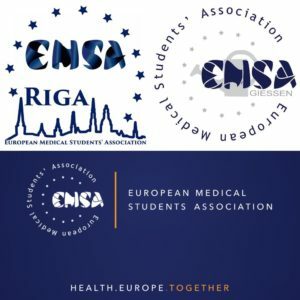 The Twinning Project Organisation Committee (OC) consists EMSA Giessen and EMSA Riga. a) The dates mentioned in the contract are fixed. suitable substitute for the project, you will get back the money for the social program. Travel expenses can not be recovered. d) In case of cancellation of the Twinning Project, EMSA RIGA or EMSA Gießen is not responsible for the Costs already made. • The participant must participate in both parts of the project: staying at the twin partner as well as welcoming this partner at home. Dispensation can only take place in case of emergency, disease or death and always after consultation with the Twinning Project OC. • The participant must participate in the project in an active way, in the home city as well as in the twin city. The guest twin should not be kept from participating in the program organized by the OC. • The participant should respect his/her twin’s values and points of views. • The participant should provide the twin with a home and at least two meals a day during the whole project. • If any problems between twins occur this should be reported to the OC. • The participant should pay its own travel expenses to the first activity and from the last activity back home for himself and his twin. • The participant should pay his own drinks. • The Twinning Project OC is not responsible for any lost or damaged goods. Participants are in all cases responsible for their own behavior and the consequences of this behavior. • The participant must be insured in the twin country, for example health and accident insurance! • The participant must report his expenses truthfully and must have a receipt of these expenses. • If a participant doesn’t stick to the rules mentioned above, the Twinning Project OC has the right to keep this participant from further participation. No money will be refunded.